Picture this, Mr Fifi Friendly came back from a work night out with a present for us. Miracle! It turns out that because Mr FF had booked his team’s Christmas Lunch at Kyloe in Edinburgh (part of the same group as The Huxley), they kindly gave him a gift voucher to return in January or February….. result! (It is probably appropriate at this stage to thank his lovely team and also suggest that they kindly go back to Kyloe again this Christmas!). I have been to The Huxley in the west end of Edinburgh a few times, so I was delighted with this unexpected gift. In October we went there for my brother’s birthday lunch …. good food was eaten and lots of wine was consumed (my mum and brother were particularly happy with the amount of wine they had…. and only embarassed us for the last half hour that we were there!). The only downside was our table which was plagued by little black flies …. they were kind of gross. Apparently the table area had been sprayed before our arrival but this had not worked. Since then I have also been with some friends for a prosecco filled lunch, which we are keen to do again. The Fifi Friendly family visit to The Huxley yesterday was nothing short of outstanding. We had a window table, which occupied the kids who loved watching everything go by. The kids were also treated to a kids pack that the staff handed over. 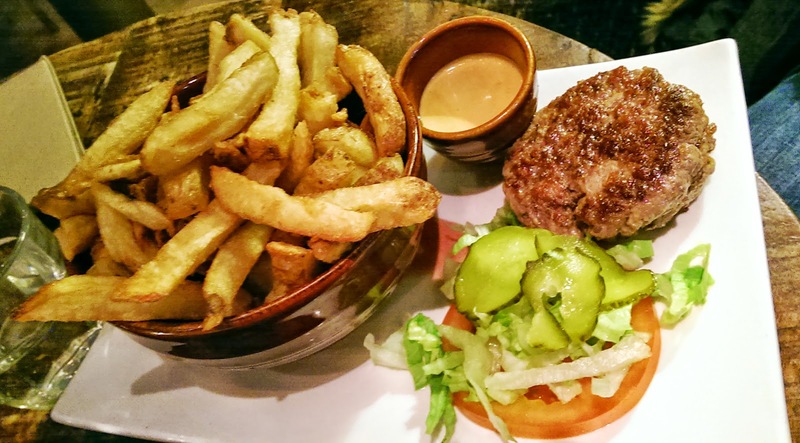 The menu at The Huxley is definitely comfort food but this comfort food is locally sourced. If you like good quality hot dogs and burgers you will be in heaven. They are both gluten free (minus the bun) so my son and I were well catered for. We ordered the Classic Huxley Steak Burger, 2 x naked Hot Dogs and a Piggy Burger (burger with pulled pork, maple glazed bacon and pork scratching crumbs). Our food came and was fairly quickly wolfed up. The hand cut chips deserve a paragraph to themselves! I was loathed to leave any. Perfect crunch and flavour. 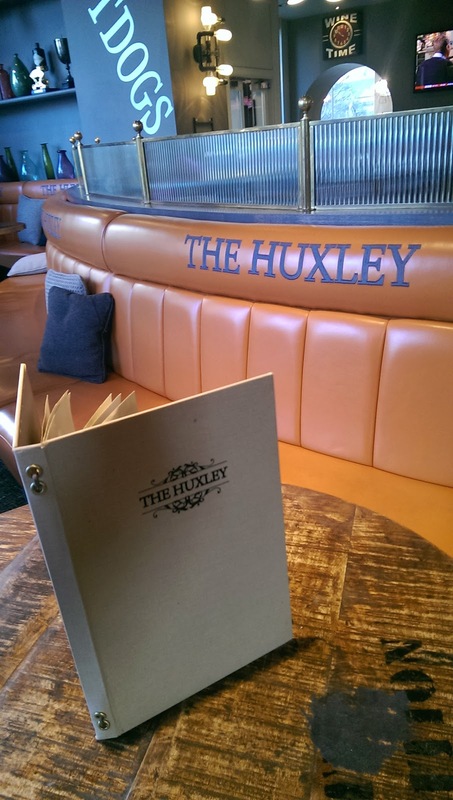 So far The Huxley had top marks for the food … both gluten free and regular… and the surroundings were good too, but one area that I was really impressed with was the staff. Yesterday my throat was fairly mullered. In fact it was so broken that I sounded like I smoked about 140 cigarettes a day (which I don’t)… that is being nice. Yes it was husky, but beyond the point where it would be great for karaoke or be on a dodgy phone service, as you could barely understand most things I attempted to say! Enter one of our fantastic servers called Miguel. As I apologised for the lack of voice, he very quickly offered to bring me a hot water, lemon and honey. It was perfect! We didn’t find ourselves looking for staff at any point, they were really attentive. For those of you who like to partake in a cocktail or two, this place has a great menu. I love that the cocktail list is not the standard one that you see elsewhere. They really capture your imagination. Purely for research purposes I tried the 1/4 Life Crises which is a quaffable mix of Brugal Rum, elderflower liqueur and blueberries. SOOOOO GOOD. Miguel also made me a hot rum, lemon and honey which I could have happily drank all day. 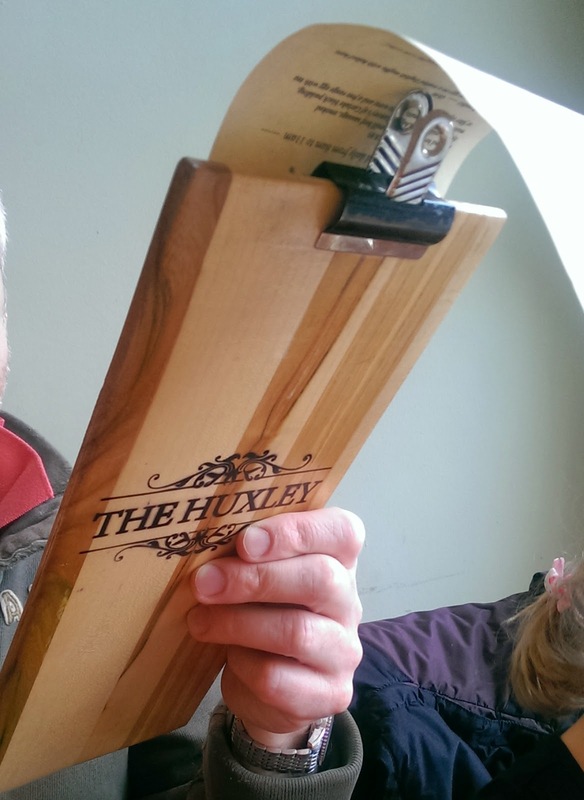 (The Huxley…. Miguel is a keeper and we think he should be employee of the month …. presuming you do such a thing). I appreciate that The Huxley also has a mean breakfast menu and I would be well up for returning to try it out. Their daytime and evening menu also has a lot more offerings than what we tried. I was eyed up a flatbread that was delivered to a table near us. I can however recommend the Frickles and Buttermilk Fried Chicken which my brother had when we visited before. The Huxley gets a big thumbs up. Great for families, great for friends to catch up and great for a cocktail!! Previous Post Orange and Kiwi Juice – Who would have thought! Next Post In search of Mascara to give Va Va Voom!